I never dreamt I would travel to South Africa, yet here I am, sipping matcha and sitting on a deck at the Ezulwini Game Lodge in the Balule Nature Reserve (part of the Greater Kruger Nature Reserve) in Limpopo Province, South Africa. Monkeys are playing in the trees within ten feet of where I sit. As is customary for all my travel, foreign or domestic, I carried a supply of tea with me. I worried about taking my bamboo whisk for fear of breaking it, but my issues were resolved when my good friend, in whom I have instilled a newfound addiction, I mean love, for matcha, bought me an electric whisk from DavidsTea (which I think they have now discontinued). While not my favorite whisking method, this electric device is perfect for travel. With a thick cover for easy storage and packing, it also functions as a vessel in which to make your matcha (I simply cannot bring myself to use a synthetic container of any sort, since I believe it destroys the flavor, and I was fortunate to find teacups in every place I stayed). So here I am, drinking matcha, waiting for the sun to rise and listening to the world come to life. My meditation for the past 4 mornings (and evenings) involved sitting for three hour stretches of time in an open-aired Land Rover, as our guide drove us through the bush on the “hunt” for some animals of South Africa. All of this land outside of the Kruger Nature Reserve, according to one of my guides, is private property, and was primarily hunting lodges where people killed big game as trophies. That all changed 2 decades ago when one of the lodge owners wanted to protect the wildlife, and believed another form of tourism could better help the conservation efforts. They asked the neighboring lodges to drop their fences, to end killing and poaching, and to support nature. Most of the people in the area agreed and now these protected animals are beginning to thrive once more. Sadly, poachers still manage to make their way into these protected, usually seeking the endangered black rhinoceros. 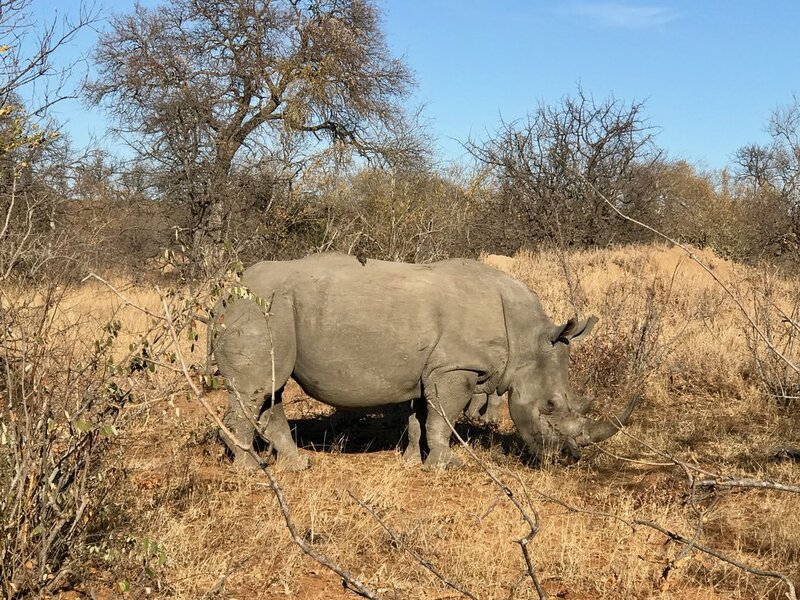 In many forms of traditional medicine, rhino horn has been touted for numerous medicinal properties, such as healing inflammatory conditions (arthritis, gout, and fever), GI disturbances (nausea, vomiting and food poisoning), but also headaches, anxiety, and hallucinations. Even though 1n 1993 China banned the trade of rhino horn, the demand for rhino horn is still exists. In fact, as I was leaving the lodge I heard of poachers into Greater Kruger killing some rhinoceros. On these long drives I practiced being as present as possible to this new and extraordinary moment. Breathing in the fresh cool morning air was invigorating. Riding along, often in silence, I observed my breath and reminded myself to breathe in life - to breathe in the life of this particular time and place, to breathe in the energy of the plants and animals (and people) around me and allow their spirit to fill my lungs, becoming a part of me. As I exhaled, I breathed out gratitude and appreciation for this land. If constriction or tightness crept in to my breathing, I returned to my intention - to fully be present and breathe this moment. These safari drives were also a meditation on my other senses as well. The arid winter landscape with its brittle grass and trees dazzled my eyes as they changed colors throughout the day from sunrise to sunset. And the animals! Although the trackers and guides spotted most of the animals, scanning the horizon and dirt below to detect any signs of movement became an enjoyable, deliberate and focused meditation in and of itself. Once discovered they would drive us as close a possible, often within a few feet, and I would stare, wide-eyed in awe and wonder at these amazing beings in their natural habitat. Watching a den of sleeping lions, engulfed by a herd of cape buffalo, or surrounded by elephants, including a few newborns, was breathtaking, and furthered my sense of wonder and appreciation. Before going on safari, however, I spent three days in Cape Town, on the "hunt" for something else - a new locale in my never ending pursuit of matcha. We stayed in Bantry Bay and the location included a view diametrically opposite of the one from my deck in the bush. At Bantry Bay, I had a expansive and equally awe inspiring view of the powerful waves of the Atlantic. Nothing is more calming to me than being lulled to sleep by the sound of waves on the shore. I arrived at my lodgings around 11 PM, after a grueling 24 hours of air travel, and tried sleeping to align my internal clocks with the local time. Somewhat successful, I woke the next day hungry for breakfast. I pulled up my handy list I compiled weeks ago of potential matcha-carrying establishments, and surprisingly the first one was a mere 5 minute walk from my apartment. The Scheckter’s Raw restaurant not only delivered on the matcha front, they had a tasty and healthy breakfast. First off, I ordered an organic matcha almond milk latte. This matcha was much lighter and thinner than the matcha lattes I make or have in the states. However, the almond milk was less sweet. I did not get a sense of bitterness and the color was a pale green. I must have enjoyed it since I ordered a second one before I left, and went back the next day for another. They had other matcha-flavored items on the menu, but my ecstasy at seeing matcha pancakes was short lived, when I found out they contained gluten! Sigh…regardless, I was delighted to discover other healthy, whole food, gluten-free options, like the quinoa porridge made with organic peanut butter, strawberries, bananas and a combination of almond and coconut milk, and a touch of vanilla. Like its name, this was hearty and fulfilling. Yes I highly recommend this place. After a sobering visit to Robben Island, we wandered through the V&A Waterfront in search of food, and stumbled across their Food Market. The very first booth I saw sold ice cream, and had non-dairy, coconut matcha ice cream! I wanted to dive right in, but knew I had to eat something more substantial first to justify getting two scoops (for the second I chose peanut butter coconut ice cream - if you haven’t tried this combination, I highly recommend it). While enticing, I wanted the matcha flavor to be a bit more bold and pronounced, but I recognize this might not be everyone’s cup of tea. One stop I was certain to make on this trip was to the Original T Bag Designs store in the V & A Waterfront. Initiated by Jill Heyes who moved to South Africa in 1996 with her husband and daughters, she was shocked and overwhelmed by the abject poverty of the people living in settlement of Imizamo Yethu, Hout Bay. Wanting to make a difference, she began teaching the women hand craft skills so they could make something to sell and support themselves financially. Word got out and more and more women came to learn, and the community of woman grew who began teaching one another. The first attempt at art work involved paper mache items, but that was not as successful. Eventually the idea of using something readily available and abundant - used tea bags emerged. Original T Bag Designs concept is to take recycled teabags, dry, empty, iron and then pain them and turn them into functional art products like stationary, wooden boxes, trays, coasters, dish cloths, bracelets and more. Of course, I purchased several items for myself and for gifts. Who knew that my beloved drink could be used to help women gain some independence and help support themselves or their families? Tea can, indeed, change lives. Please remember that any time you are ready to discard your teabag into the trash (please compost if you can, or better yet, make some art). The last of my matcha discoveries came the next day when I visited Long Street searching for Lady Bonins Tea shop. The driver found 13 Long Street, so I hoped out of the car, naturally assuming that number 12 was nearby, merely across the street. To my consternation, not only could I not see any numbers on the store fronts, no tea establishment was in sight. After wandering several blocks and crossing a major intersection, I reversed direction, and returned back to my drop off location. I continued in the other direction for several more blocks and decided to give up. Perhaps there is another Long Street, I wondered. Deciding to wander around since I was in the area, a block later I found myself facing a sign for Lady Bonins Tea. I asked the gentleman behind the counter about the address, but he explained that the numbers weren’t necessarily sequential. While that defies my concept of logic, I am just glad I found it. What a find! According to the website, Jessica, aka Lady Bonin, established her business in 2010 as Cape Town’s first food truck and the world’s first Tea Caravan with the mission of bringing organic loose leaf tea, sourced directly from growers who practice sustainable farming and are community driven. Combining her passion for tea and socio-environmental justice fills my heart with such joy. Jessica recognizes that tea can be a significant vehicle for impacting health of individuals, communities, the environment, and the planet! Hopefully if all of us support biodynamic farming and other sustainability efforts, along with living wages for all, monopolistic tea farming corporations that fail to support the land or the people who harvest their tea will gradually decline. Thank you, Jessica, for making a difference in the lives of some many people. And let’s not forget the shop! The space is divided into three subsections. When you walk in, the first section is the storefront, with one wall lined with all the teas for purchase. The opposite wall has the menu above the counter where they make your tea. In the middle area is somewhat of a small outdoor patio with streaming sunlight, while in the back is more seating and a tea bar where they offer tea tastings and matcha preparation (sadly I was unaware they needed advanced notice or I would have scheduled it). I adore this space and could envision myself sitting in the back for hours talking with friends over some amazing tea. Once again, I ordered a matcha latte with almond milk. Even before tasting it, I purchased a container of their organic matcha since I loved the packaging, which shares just a bit about matcha's brief history. I did not ask the gentleman behind the counter about the quality, but I believe this was culinary grade. Organic production of matcha is very difficult on the plant, and keeping the soil rich enough to ensuring a powder that is vibrantly deep green in color without any bitterness is challenging. The color here was a bit flatter greener and I did detect more bitterness even through the almond milk. The label did not mention anything about the grade, and I have yet to open it, so I know more once I return to The States. Still, I want to support Lady Bonin and their efforts to make a difference in the world. I only regret not purchasing more of their tea, like sencha, dragonwell or any of their rooibos teas. Lady Bonin, let me know when you ship to the states or open a store there. I will support you! For now, I will drink my ceremonial matcha, prepare for my last day in the bush, give thanks for such an incredible opportunity.